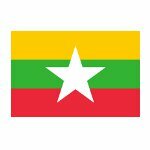 National Day is the only non-religious public holiday in Myanmar, when people have an additional day off. The date of the holiday changes every year and it falls on the tenth day after the full moon in the month of Tazaungmon of the Myanmar lunar calendar. National Day in Myanmar originates from the student uprising against the British rule. The anti-British movement had been growing among the Buddhist and students for a long time and it culminated in 1920. In 1920 students started the first protest against the British rule. The protest broke out against the new University Act, that would only benefit the elite and keep the colonial rule. The protest spread throughout the country and many schools also started their own strikes against the colonial system. Finally the protest grew into the full-scale fight against British colonization, that lasted till 1948. The anniversary of the protests came to be commemorated as National Day in Myanmar. Every year the date of the holiday has to be confirmed and it may be celebrated in November-December.